This article first appeared in CLIME Connections, Volume 7, No. 1, 1994. The big push over the past few years has been for teachers to use calculators. Unfortunately, the issue is charged because some parents have a hard time supporting teachers who use calculators before their children have learned their algorithms. Though I am a strong proponent for the use of calculators, I have to sympathize with these parents because many of the teachers that I observe have students use them only to check their work. Since this is a somewhat contrived use, students will “cheat” and use them to do the actual calculation. Contrary to conventional wisdom mathematicians have always hated tedious calculations and sought methods to ease this pain. And students should do the same. Unfortunately, this will not necessarily lead to any learning about how numbers actually work. I once watched a graduate student use a calculator to find what percent of 86 was 30. First he punched in 86, then divided it by 30 and the answer was greater than 2. “Can’t be right,” he must have thought because he immediately did it over, but this time switching the order of 86 and 30 and got an answer of .3488… which he knew was about 35%. So he knew enough about decimals less than one that related to percents to quickly get his answer. To help students not only understand how numbers work, but also gain this invaluable intuitive understanding, I would suggest “making sense” sessions with calculators. I’m not a big fan of all those “tricks” you find in calculator activity books which reinforce kids’ beliefs that math is magical and mysterious. The goal should be to take the mystery out of what happens on the the calculator, not add to it. Here’s a simple example of what I mean. I once asked my 7th grade classroom to enter a decimal number on the calculator. I noticed that everyone entered a number with a decimal point in it. So on my overhead calculator I pressed 127 and told them that this was my decimal number. Though most of them were willing to accept what I did (since students usually assume I’m a math magician and what I say goes), one student (fortunately) challenged what I said. “Your number doesn’t have a decimal point in it,” he said. In reply I punched in 127.00. “Is this now a decimal number,” I asked. He said yes. Then I pressed equal. I looked to see if the student was surprised by what happened. No expression change on his part. “Do I still have a decimal number,” I asked. He said no. “Why not?” I responded. “There is no decimal point,” he replied. Hands shot up. “Oh, you don’t need a decimal point. The calculator just turned it into a whole number,” one student shouted out. “So you mean a whole number is not a decimal number?” I said. Some nodded in agreement, some disagreed and others just seemed confused in silence. We discussed the confusion about 127 and 127.00 and eventually we realized that 127 and 127.00 were equal. The decimal point separates the whole part of a number from its fractional part. If the fractional part is 0 and 2 two zeros mean the same thing, then the calculator just drops the decimal point and the zeros when I press enter because the calculator chose to use a decimal in its simpler form. My goal was to have students understand that numbers are masters of disguise. They can take on a multitude of forms and still have the same value. The trick in problem solving is to choose an appropriate form of the number to work with. 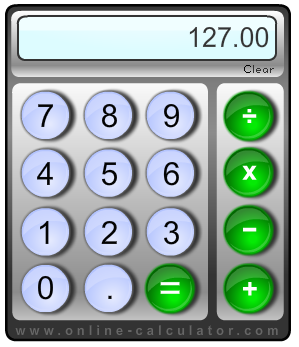 The calculator chose 127 over 127.00 because 127 is a simpler form. It took a while for this idea to sink in for my students. This idea of numbers as being masters of disguise needs to be revisited occasionally and appropriately when a choice is to be made. One way to focus on this is to do the Line Up activity.